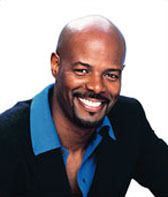 Keenen Ivory Wayans won a scholarship to Tuskegee University, but dropped out to pursue a career in stand-up comedy. He was moderately successful at stand-up in the New York area, but moved to Los Angeles hoping to break into film or television. If you want to know how it went, rent Hollywood Shuffle, a sad but funny comedy by Wayans and Robert Townsend, showing the black experience in Tinseltown. Wayans appeared as a customer at the bar in the second episode of Cheers, looking so young he should have been carded. He had a small recurring role in NBC's military soap opera For Love and Honor in 1983. Wayans met his idol Eddie Murphy while doing stand-up, and co-wrote and appeared in Murphy's concert classic, Raw. Wayans wrote, directed, and starred in I'm Gonna Get You Sucka, a blaxploitation spoof which was not successful enough to make him bankable in movies, but caught Fox TV's attention. He created and produced Fox's In Living Color, a mostly-black and mostly-funny sketch comedy show. It made Wayans famous, and made minor stars of Jim Carrey, Jamie Foxx, David Alan Grier, and the rest of the Wayans brothers. Its creator, though, left in a contract dispute after two years. Wayans then wrote and directed A Low Down Dirty Shame, a lackluster comedic riff on macho-thrillers. After that, he tried to make himself a serious action star in The Glimmer Man and Most Wanted, the latter written by Wayans. After that, Wayans apparently decided he was through with acting, briefly trying his hand at a late-night talk show, The Keenen Ivory Wayans Show. For Scary Movie and Scary Movie 2, Wayans directed, but didn't contribute enough to the screenplay to earn writer's credit. The movies were big hits, parodying Scream, I Know What You Did Last Summer, The Blair Witch Project, The Sixth Sense. No Wayans were involved in Scary Movie 3. Wayans is not in his brothers' White Chicks, but he directed it, and co-wrote the screenplay. He's hoping to direct his brother Damon in a big-screen version of the Homey the Clown sketch from In Living Color. Son: Keenen Ivory Wayans Jr.